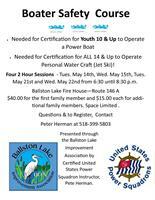 Ballston Lake, NY --- Feb. 14, 2019 --- Ballston Lake Improvement Association (BLIA) will sponsor a United States Power Squadron basic boating course for four evenings beginning May 8 at the Ballston Lake Firehouse on Rt. 146A. This course, which is approved by New York State, will be conducted by Dr. Peter Herman, a certified Power Squadron instructor. It consists of eight hours, split between four nights, two hours each night. The classes will be held from 6:30 – 8:30 pm on Tuesday, May 14th, Wednesday, May 15th, Tuesday, May 21st and Wednesday, May 22nd. Upon completion of all eight hours, the student will receive a registered card and certificate. Students must be at least 10 years of age to take the course. New York State requires ALL operators of personal watercraft (jet skis) to hold a NYS approved boating certificate and be at least 14 years of age. Non personal watercraft (motor boat) operators between 10 and 18 must have passed the course and earned the certificate. The cost of the course is $40.00 for the first family member and $15.00 for each additional family member. To register for the course, or for any other questions, please contact Peter Herman at pandsherman25@gmail.com or 518-399-5803.